This is not a book about foraging. But it is a book that every forager should read and will probably love. Braiding Sweetgrass, by Robin Wall Kimmerer, is a collection of essays that brings together the worlds of science and traditional indigenous wisdom in a way that respects both the objective data of clinical observation, and the more emotional, spiritual relationship we can enjoy with the natural world. I am not a religious person, but I am deeply moved when faced with wonderful truth or natural beauty. My idea of spirituality is unrelated to a traditional deity or religion. I revel in the enormity of an ancient volcanic landscape, the colors of a sunset at 10,000 feet, and the thrill of a huge porcini harvest. I felt the same kind of emotional response to Ms. Kimmerer’s writing. I got the book back last week and devoured it in two days. Ms. Kimmerer speaks both the language of science and the language of the heart, and the combination is uniquely thrilling. As I read, I experienced a warm knot of emotion behind my forehead. That’s the feeling I get when I read or hear or see something that moves me deeply, something so undeniably true and important that it penetrates to both my heart and mind. 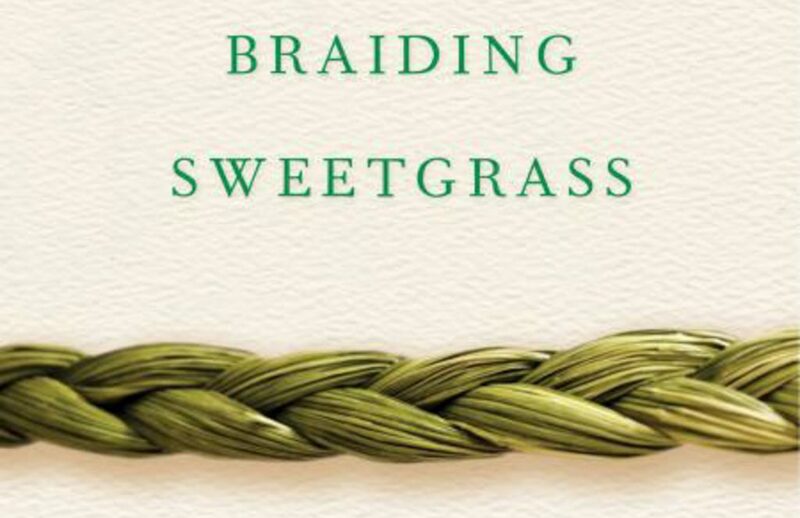 I don’t get this feeling often in life, but in Braiding Sweetgrass, I felt it in almost every chapter. I imagine that feeling a true sense of community, finding a ceremony that speaks to my heart and mind, would be enormously satisfying. The closest I’ve come is how I feel when I’m with fellow foragers. We speak a common language, we share an appreciation of the natural world. Foragers are my people, and when I’m with them my step is light, my heart is happy, and my mind is quick and questioning. The idea of looking at our relationship with the earth from new and multiple vantage points resonates with me. I applaud the combination of scientific data and knowledge acquired through generations of experience. I am drawn to the indigenous stories Ms. Kimmerer relates in a way that surprised me, considering my aversion to organized religion. Maybe because there is no single god in Braiding Sweetgrass, although there is certainly something greater than mankind. This is a book that will stay with me. It is provocative, moving, and insightful, and I recommend it to anyone who feels a deep connection to the earth. I felt the same way when I read it this past year. I also have similar thoughts regarding organized religion. I tried and failed to articulate my perception (“belief” feels like the wrong word) to an atheist friend recently. I never feel more at peace/grounded than when I’m out foraging. It just feels like love. Laura, I consider myself an Atheist with a capital A, but I feel something profoundly spiritual when I’m foraging, or even when I’m out in nature just being. I know what you mean by saying it feels like love. I am at peace, I feel like I am where I should be, relaxed, full of wonder. This feeling, for me, has nothing to do with a supreme being or codified rules of morality. The word spiritual has so many connotations that are religious; I hesitate to use it most of the time. But I don’t know any other way to describe the way foraging and being in nature make me feel. I treasure the feeling, whatever we call it.